In a government statement today, Michael Gove, Secretary of State for Environment, Food and Rural Affairs, says the UK supports further restrictions on the use of neonicotinoids because of their effects on bees and other pollinators. The announcement, says the statement, follows advice in October from the UK government’s advisory body on pesticides, the Expert Committee on Pesticides (ECP). 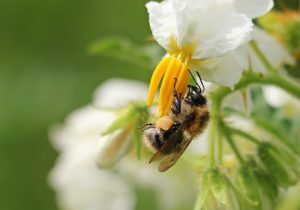 Scientific evidence now suggests that the environmental risks posed by neonicotinoids are greater than previously understood, says the ECP advice. Since December 2013, says the Defra statement, the EU has banned the use of three neonicotinoids (Clothianidin, Imidacloprid and Thiamethoxam) on a number of crops attractive to bees. This partial ban is currently under review. Extending the ban to crops that don’t flower will create problems for UK farmers, especially for those producing sugar beet and cereals. For sugar beet, there are no alternatives to neonicotinoid pesticides for controlling aphids and the viruses that they spread; there is widespread resistance to pyrethroids and carbamates. For cereals, pyrethroids are currently working in controlling aphids but we know that resistance mutations are already in the population; if pyrethroids become the main control measure, it will make selection (and increasing resistance to the pesticide) more likely. The thing that concerns me most with these decisions is that, if you ban something, you need to be completely aware of the consequences. There will be known consequences and unknown consequences. If you have no alternative available, you might be forcing people to use something older that is worse, or forcing them towards something new that might turn out to be worse. There is not enough of a holistic view of the way that we farm, and the benefits as well as the risks of current approaches. People are perhaps more aware of the risks than they are of the benefits. For today’s official statement, the ECP advice and Gove’s comment, plus previous Rothamsted comment on neonicotinoids, and other coverage, see Notes to Editors.